“So far so ordinary” indeed but it takes a turn for creeper-ville once the mom drives across town, breaks into her adult son’s house through his second floor window, and rocks him to sleep. Don’t get me wrong, I love my mom, but if she drove over to my college apartment, broke through my second story window via a ladder, and tried to crawl into my bed with me, I’d be freaked out! If you ask me, the main lesson of this book is probably that mothers and children should remain embarrassingly attached to each other and never grow up. Here are the books that I did love, however, many of which probably have a lot to do with why I turned out the way I did. 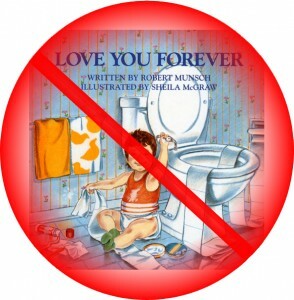 the way the parent cared for the child, and the promise to love “no matter what” – terrific. Mom not using the front door – terrifying.